During a recent tour of Turkey I had the opportunity to visit Gallipoli for a day – now a peaceful, picturesque peninsula. Among the wheatfields, wildflowers, native roses and bright yellow broom bush it was difficult to imagine it as a battleground, devastated by warfare as it was in 1915. Our guide, Mr Kenan Celik, OAM, a Turkish academic, has been leading tours around the Gallipoli battlefields for 27 years. A frequent visitor to Australia, he has guided many Australian politicians and writers around the sites – Les Carlyon, Peter Weir, Harvey Broadbent, Peter Fitzsimmons, Quentin Bryce etc. He has an encyclopaedic knowledge about the campaign from both the Turkish and Allied perspectives. Our first stop was at the village of Bigali, where Ataturk was based during much of the campaign. His house has been restored and can be visited, showing his simple lifestyle while directing his troops. His statue faces the direction of the battlefields from atop a small hill in the town. A plaque on a wall illustrates the friendship now between our two countries, describing how the Australian Government’s Direct Aid Programme funded the installation of solar electricity lighting in the village square in 2010. In a nearby town an old house has been transformed into a museum, displaying many personal and military artefacts recovered from the battlefields – buckles, badges, bullets, bombs etc, and models, maps and drawings of the battles and the terrain. We then drove on to the sites of the landing and fighting, visiting memorials and some of the cemeteries where many victims now rest. Having been interested, but not actively involved in the Mosman “Doing Our Bit” project, I decided shortly before departure that perhaps, if the opportunity arose, I could photograph the headstones of some of the Mosman men who died at Gallipoli. A very quick look through George Franki’s book resulted in a list of around 35 possibilities, and the Australian War Memorial Honour Roll gave locations of their burials. Of these I (assisted by my cousin and other fellow travellers) was able to find and photograph over half of these memorials. 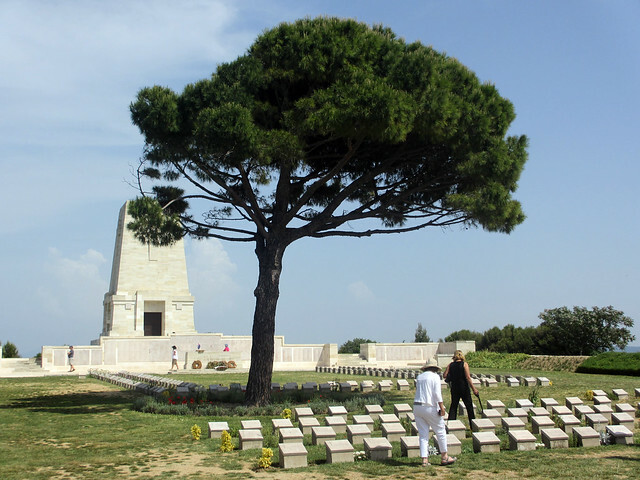 We visited Lone Pine, the largest of the cemeteries, its large memorial commemorating thousands of soldiers, and where the majority of the Mosman men are listed. Unfortunately they are in many alphabetical sequences, by unit and rank, and time did not allow us to find them all, though all five “headstones” were found. (A number of the headstones throughout the cemeteries say “Believed to be buried in this cemetery” so are a memorial rather than marking the actual grave site.) The pine tree is not the original, having been replaced several times as trees died of disease, old age or were burnt down in bushfires which regularly ravage the peninsula. Other cemeteries visited were at Hill 60, Ari Burnu, and Mosman men found at Shrapnel Valley, Beach, Quinn’s Post, Johnson’s Jolly and Walker’s Ridge. Unfortunately we did not visit Shell Green, where four Mosman men lie. The cemeteries, maintained by the Commonwealth War Graves Commission, are all in the same style – the cemetery name engraved in a sandstone? block at the entrance, a large memorial bearing the words “Their Name Liveth Forevermore”, and the headstones, varying in number from hundreds to just a handful, laid out in well maintained lawns with small shrubs between each one. Several are in positions with spectacular views over the ocean and the hills of the Gallipoli Peninsula. There is also an impressive Turkish memorial, being visited that day by many busloads of Turkish tourists, with monuments to a selection of soldiers, apparently representative of the many cities and towns in Turkey from where the troops came. Of course we visited the site of the Anzac dawn service – the front area closest to the narrow beach being for dignitaries, and back across the road for the general public – the space being much smaller than it appears on television. Various plaques and information boards tell the story of the landing, and behind this fairly flat space rise the cliffs which the soldiers faced upon landing. The next cove, the actual Anzac Cove, has more plaques and information, the cliffs here being even steeper and closer to the shore. Looking down from the tops of these heights exemplifies the advantage held by the Turks. The area is subject to periods of heavy rain during the year so there is much erosion on the cliffs, emphasising their cragginess but obliterating any remaining evidence of the war. In some areas trenches and dug-outs have been recreated in order to give tourists a taste of soldiers’ living and fighting conditions. We had a very informative and enjoyable day at Gallipoli, made more interesting by having some names of men with Mosman connections to look for, and to think of their short war and the loss felt by their families at home. Thanks for posting the photo of my great uncle’s (W Pouget) headstone. If I never get there to see it myself at least I have seen the photo.